The need to gain alignment among the members of the leadership team is a traditional refrain in discussions of strategy formulation and implementation. There are few who would argue that it will be possible to be successful if the members of the team are not in agreement. One of the things that we found at the USPS during years of intense change in the business environment, was that it’s exceptionally difficult to know whether you have alignment. People won’t tell you. It’s not that there is intentional deception. Often leaders of businesses and functional leaders want to be loyal and they will say that they are aligned with the boss’s policy direction. But there is value in probing to know what they understand. If you don’t know whether you are aligned, you will inevitably communicate this to the enterprise whether by intention or not. The trajectory of your strategic journey will be skewed. We developed a brief presentation that explored each of the variables – the regulatory environment, technology, the workplace and degree of change in human capital matters, changes in the marketplace, and changes involving the competition. 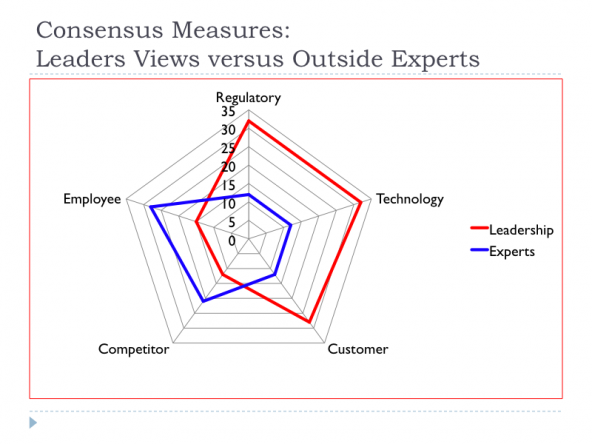 By interviewing each of the members of the team (see the red and blue lines in the graphic used as illustratioins) we were able to compare the ways in which different members of the team had a different profile from one another or an average of their estimates might agree with outside “experts”. Creating a graphic like this one provides a way to communicate the areas of alignment back to the team. What comes next may be the most difficult question of all. Even when its clear that there are differences among parts of the leadership team and even when its clear that the differences involve specific questions such as estimating the speed with which technology change is forecast to impact the future of the enterprise, the second question is why? Did the leaders learn the right lessons about the market? Do they understand the implications of new technology? Highlighting alignment is only a first step on the transformational path but its an important one.